The article is based on the integration of DHL Paket to your WooCommerce store. In addition to that, you’ll get to know a lot about DHL Paket in general too. ELEX WooCommerce DHL Express / eCommerce / Paket Shipping Plugin with Print Label plugin shows live rates from DHL Express. These rates are based on the dimensions and weight of the items in the cart. The rates are shown based on the automatic and efficient box packing through smart software. 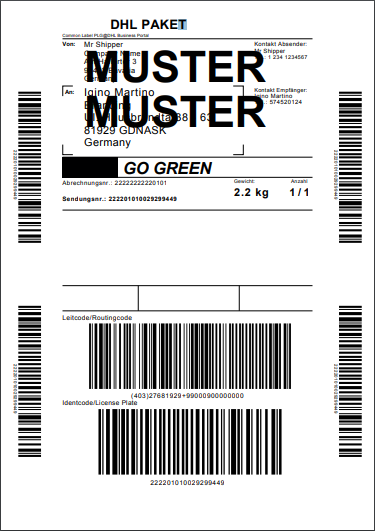 Once orders are placed, you can create the shipping labels. To print labels from within the plugin you go to WooCommerce> Orders and select the specific order. Once you move the order page, you can click on ‘Create Shipment’ to have your shipment ready. 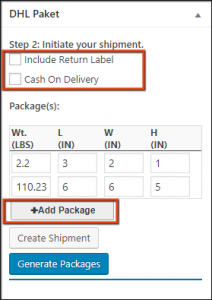 The plugin offers three ways of Shipment creation. DHL Paket is essentially for a business owner who ships from Germany. As you noticed, there are three ways of creating a shipment and print label with our WooCommerce DHL Shipping Plugin, we’ll focus on DHL Paket here. DHL Paket allows you to send item all around Germany and Internationally*. It is one of the fulfillment units of DHL and is available for DHL Customers both Private and Business Customers based in Germany. Domestic Rates starts at EUR 4.99 for 2 kg parcel. EU Countries Rats starts at EUR 8.89 for 2 kg parcel. Non-Europe Rates Starts at EUR 15.89 for 2 kg parcel. Packset Pricing starts at EUR 1.49 for 2 kg parcel. Business Customers are those send more than 50 packages per year. Basically, if you are having a registered business and want the shipping to be more documented, you need to register separately to be a Business Customer. This includes transparency to your shipping services too. Shipping rates are not fixed and reduce proportionally to the volume of packages sent per year. It offers three varieties of accounts, which differs only on the pricing of shipping services. if you have less usage, you end up paying higher. To get a personalized shipping rate you can use these three pricing patterns from DHL Paket. With this pricing pattern, you can ship within Germany at shipping rates starting from EUR 3.49. You don’t even need to land a contract with DHL in order to print labels and send your parcels. You can also ask for already printed labels from DHL. To add convenience and instead of doing the manual filling of documents, use WooCommerce DHL Shipping Plugin for creating all documents automatically and print it at your warehouse. You can start saving as soon as you send the 10th package with DHL Packet. There are few more target points which makes you eligible for further savings in shipping expenses. Not only this each of your ‘paket’ packages is covered up to EUR 500. Your packages get picked up for free, from the address you agree to. You can go international along with Germany. Send Packages on Saturdays through 2,500 pack stations. Special Online portal to manage shipments. With this, you can send parcels up to 31.5 kg nationwide in Germany. You can expect a delivery on the next working day. International shipping in 220 countries even on Saturdays. Time Specific Shipping- Choose a more specific time. As a matter of fact, a fixed set of rates are not available with DHL Paket and Shipping rates can be different for different individuals. So you private customers can use a flat rate that can be either an average of all individual shipping charges or it can be kept slightly higher than the average. If you have shown a shipping rate based on your DHL Paket account, you can create shipment with any of these services for the order automatically with our plugin. While on the order page, you get all three options to create a shipment, you can’t use the service partially. It means one order’s shipment has to be created by one service only. With the creation of shipments, tracking ids are created simultaneously. Tracking Ids are fully-automated and sent to your customers and you both parties can track the parcel manually too. Finally, you get the option to generate a shipping label. With WooCommerce DHL Shipping plugin you are one click away from creating a shipping label. As shown in the above image, DHL Paket packages can be created by clicking on Generate Packages button. As you click on generate the package, you get the following table. The table prompts you to initiate your shipment. You can choose to include a Return Label and Cash On Delivery by checking the boxes provided. The package(s) table shows the predefined DHL Paket boxes. If your items not fitting in these predefined boxes you can assign your own boxes, by clicking on Add Package to create the package. Once you are complete the assigning of boxes, click on Generate Package to pack items automatically. Based on the packages and item details, the plugin gives you the option to create the label for the shipment just created. 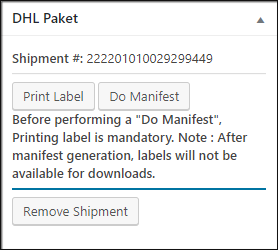 The DHL Paket Section shows a message which says that you need to print the shipping label before going for a “Do Manifest”. Printing of label before printing manifest is necessary because the label file will not be available once you generate the manifest. This message also shows the shipment number generated. So now you get options to print a label and then you can print a manifest, which contains a list of all shipments created till a date. You can select the date up to which you want the manifest. Here, you can also remove the shipment by selecting remove shipment. Tracking of shipment provides a peace of mind to both the customers and the senders. With WooCommerce DHL Shipping Plugin it is automatic. Tracking Id is generated and sent automatically to your customers. 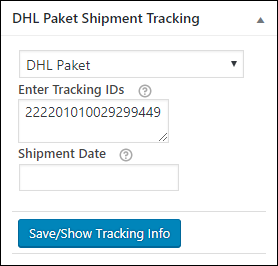 You can either save or see the tracking info by clicking the Save/Shoe tracking button in the DHL Paket Shipment Tracking Widget. The plugin returns tracking info with any of the three services, i.e DHL Express, DHL Paket and DHL Ecommerce. 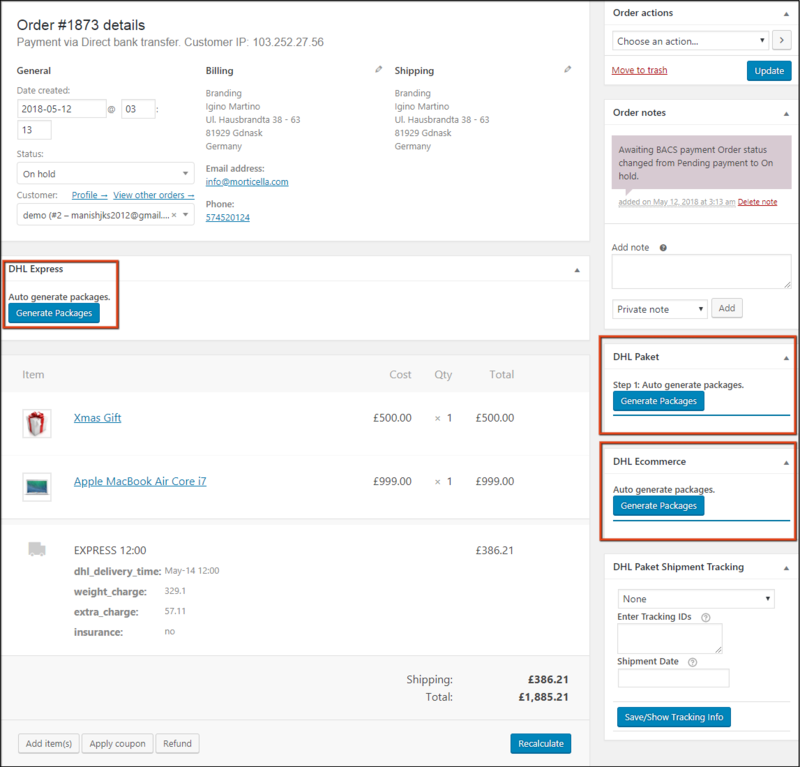 You can also send this manually to your customers through a similar widget in the top right section of the order page. As you just found out that ELEX WooCommerce DHL Express / eCommerce / Paket Shipping Plugin with Print Label has three services namely DHL Express, DHL Paket for Germany based sender location, and DHL E-commerce, the plugin makes it a one-point solution for anyone using DHL services. The plugin can be used for personal use and even for large e-commerce stores. Location is not a bar for the plugin and shipping charges gets converted according to the store currency. While using DHL Paket you also get DHL Europaket Compatibility which let you swift, uninterrupted delivery to 27 EU Nations. I hope you had enough information regarding DHL Paket and now it would be easier to configure DHL Paket in WooCommere DHL Shipping Plugin with Print Label and Tracking. If you still planning to purchase a subscription of the plugin, feel free to contact our Online Support. Frohes Verkaufen!